Over at Light & Motion, they’re still putting out the quality lights that divers and underwater photographers have come to rely on, but they’ve added a couple new star players to this year’s lineup that demonstrate their commitment to quality and usability. With an in-house production facility conveniently located in Monterey, California, Light & Motion‘s engineers and fabricators have the unique ability to respond in real time to customer feedback on their products, resulting in lighting instruments that are powerful and user-friendly. All of the SOLA dive lights feature an intuitive dashboard configuration that makes it easy to switch between three light strengths and an SOS emergency signal, as well as factory-sealed compartments and magnetic switches which eliminate any worries about flooding. Each light features a wet-charge contact which allows the light to be charged and recharged in the field, which makes it an asset on boats, where a surface interval may be all it takes to get your light charged enough to go back into action for a second dive. SOLA lights are also compatible with an array of mounting options from handmounts and mounts and t-mounts for rec and tech divers, to locline and ball mounts for serious underwater photographers. Last year’s release of the GoBE system with its changeable lens-heads seemed hard to top. 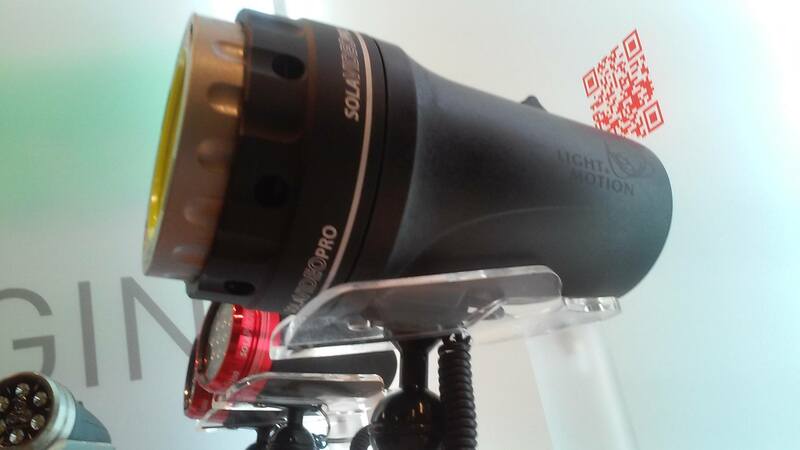 This year, however, Light & Motion is debuting two exciting new products, the SOLA Laser and the GoPro-friendly Sidekick. An innovation on their 600-lumen flood, the $799 Laser incorporates a green laser beam which will allow dive buddies and instructors alike to point directly at features of interest with the kind of precision that makes the difference between seeing a bank of beautiful coral and catching a look at the sneaky octopus that’s living inside that coral. The next big thing is the Sidekick, a compact but versatile light designed to close the gap between professional underwater photographers and an ever-growing population of entry-level GoPro users. Light and streamlined, the Sidekick is compatible with any GoPro mount, but also can be adapted to a Locline and arm system to offer a bit of distance between the light and the camera, reducing lens flare. The Sidekick offers both a narrow spot and a flood, with Light & Motion‘s standard three lighting strengths in each setting. Retailing at just $149.99, the Sidekick can really up your game without draining your bank account. While you’re definitely going to be bowled over by the exciting new developments at Light & Motion, don’t overlook their reliable standards from the 8000 Pro with its OLED screen and water-aided cooling compartment or their SOLA Nightsea, which utilizes powerful blue diodes to excite biofluorescence during night dives. A new innovation on their excellent standards, the new Fast Charge feature (indicated by a white, rather than a black body) offers even quicker charging on SOLA lights, with recharge speeds averaging an hour and forty-five minutes for a full charge on the SOLA VideoPro8000, 3000F, 2500F, and 2100 S/F, with an 80% charge ready in fifty minutes. That should encourage you to get — and keep — your feet wet! Earlier this year, they moved their facilities out of Monterey to the neighboring town of Marina in order to expand their manufacturing space to double the capacity of the old factory. We mistakenly reported that the SOLA Tech 600 was a flood, when in fact it is a spot, with an 8 degree beam that is matched by their new Laser. Finally, while the SOLA VideoPro 8000 and 3000F do have the new Fast Charge feature, but are brand-new, rather than improvements upon the old. Want! 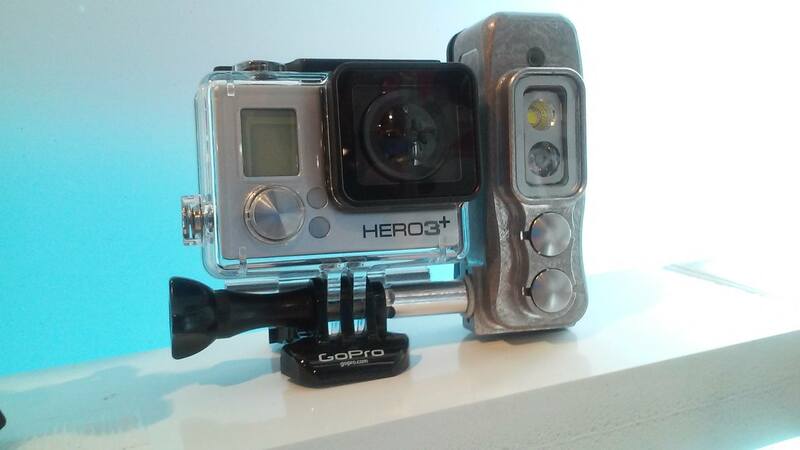 Want want WANT the Sidekick… how about a pair of them on either side of the GoPro?